With our expertise in this domain, we are engaged in providing a wide range of Cough Drops. These drops are highly demanded & acclaimed by the patrons owing to their optimum quality and high level of effectiveness. Our products are manufactured using the latest technology & machines, which makes these highly effective. For Pharma Products Composition: Different Chemical Substance. 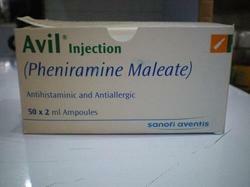 Avil contain pheniramine maleate, a medicine used to treat allergic conditions such as hayfever, runny nose, itching skin and skin rashes. It is also used in the prevention and treatment of inner ear disorders and travel sickness. Avil is one of a group of medicines called 'antihistamines' which works by blocking the action of histamine. Vitamin A is a vitamin that is needed by the retina of the eye in the form of a specific metabolite, the light-absorbing molecule retinal, that is absolutely necessary for both low-light (scotopic vision) and color vision. Vitamin A also functions in a very different role, as an irreversibly oxidized form of retinol known as retinoic acid, which is an important hormone-like growth factor for epithelial and other cells.